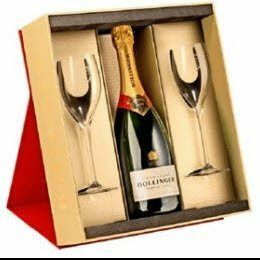 Bolly can make some elegant Champagne gift and this present was the most sold Christmas gift last year. Bollinger Champagne 2 Riedel Glasses with the Bollinger logo on the glasses gift. You can add a Birthday, Christmas, anniversary or thank you card. If this is a special gift you can pick the delivery date after you checkout. Bollinger Champagne Special Cuvée is perfect shared among friends, for a simple and meaningful moment. It is the champagne we give to the people we love and who love nice things. To enhance its unique style, bouquet and aromas, Special Cuvée is best served between 8 and 10°C. You can enjoy Special Cuvée right away, or choose to age it in your cellar. The blend consists on average of 60% pinot noir, 25% chardonnay and 15% pinot meunier, harvested from 30 different villages in Champagne. 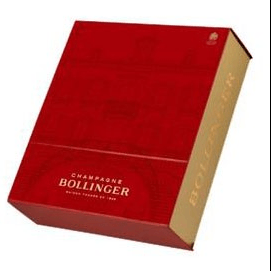 Special Cuvée matures for a minimum of three years in Bollinger's cellars prior to release.